Bollywood celebrity couple Ranveer Singh and Deepika Padukone got married in a private ceremony on Thursday 15th November at Lake Como, Italy. The couple later in the day released photos from their wedding ceremony from their respective twitter accounts. 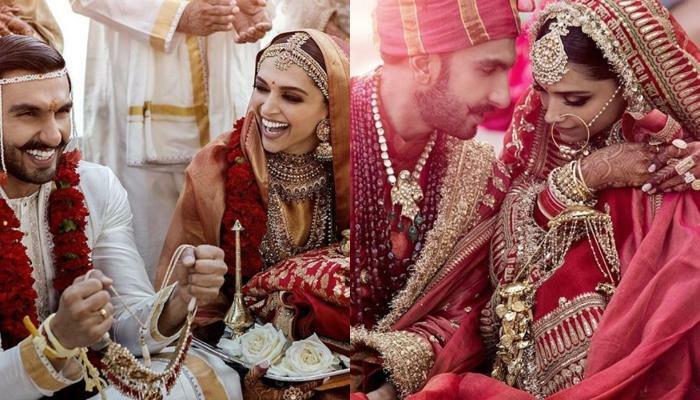 The wedding pictures show Ranveer Singh and Deepika Padukone smiling while performing wedding rituals. Deepika Padukone and Ranveer Singh were dressed in traditional dresses. Deepika Padukone dazzled in a dark red from famous designer Sabyasachi Mukherjee. There were only about 40 guests for the celebrations, but a no-pictures policy imposed on them, left the couple’s fans pining to get a glimpse of the gala. Mobile phones were not allowed in people’s rooms, and there were boats patrolling the lake for drones as part of the three-level security. The couple exchanged rings on November 12 followed by a mehndi function on November 13th and Sangeet the same day in the evening. Soon after the release of the picture several Bollywood celebrities took to social media to congratulate the couple. Katrina Kaif, Karan Johar, Varun Dhawan, Alia Bhatt, Abhishek Bachchan, Hrithik Roshan, Aditi Rao Hydari, Shilpa Shetty, Priyanka Chopra, Parineeti Chopra, Bipasha Basu and Anushka Sharma were among those who showered love on the newlyweds. “Wishing you both a world of happiness and a beautiful journey together. May the love and respect you have in each other, grow leaps and bounds. And welcome to the club,” wrote Anushka Sharma who got married to cricketer Virat Kohli last year. Previous articleShahid Afridi: A cricketer, philanthropist or politician?